LeBron James Jr., LeBron James #23, Zhuri James and Bryce Maximus James pose for a photo with the All-Star Game MVP trophy during the NBA All-Star Game 2018 at Staples Center on Feb. 18, 2018, in Los Angeles. King (Lebron) James apparently lives up to the name by doing things the Biblical way, including having his youngins imbibe on that Jesus Juice. James, who fancies himself a wine connoisseur, said his 11-year-old and 14-year-old sons also drink wine, but people should put the blame on him, not his longtime sweetheart and wife, Savannah Brinson James, who got pregnant with Bron’s namesake their senior year in high school. “Yeah, that’s how mature they are,” he explained Tuesday after the Los Angeles Lakers’ practice at the team’s training facility, reports USA Today. “They’ll be driving next week, too,” James added with a chuckle. 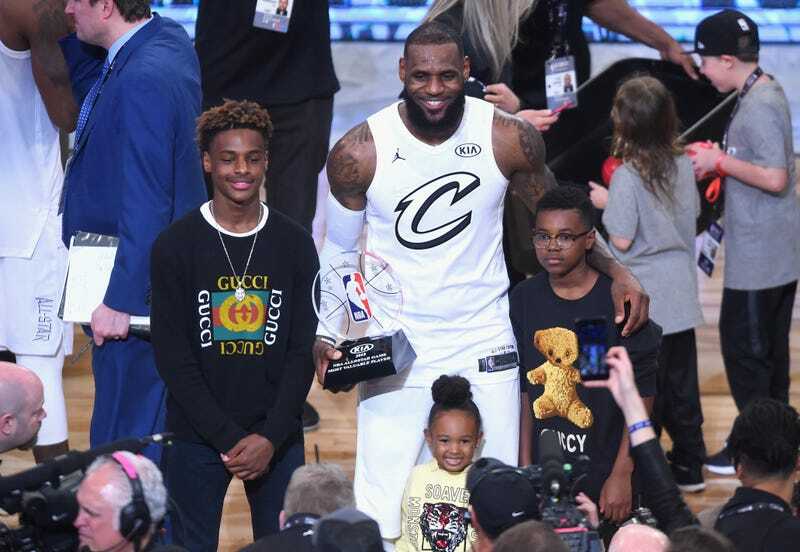 Savannah and LeBron James have three children: 14-year-old, LeBron James Jr., aka “Bronny;” 11-year-old, Bryce and 3-year-old Zhuri. Although the research is split on whether exposing your children to alcohol at a young age can lead to later drinking problems (perhaps depending on if they “sip” or chug), there are many cultures where children drinking is not necessarily taboo, the thought being that if children are taught to respect alcohol in moderation, with a parental influence present, they won’t be as pressed to binge drink when they’re finally set loose amongst their peers. And though nothing of the sort flew in my house, my friends from the Caribbean always amazed me (as in like, wowwwww) in that it was all good with rum punch and maybe some beer at family gatherings. But whatever choice you make regarding alcohol and your children, there’s one thing I know for sure about LeBron’s progeny: Those kids can afford some good vino.